There are two major players in the mobile location-based social networking niche- Foursquare and Gowalla. Both of these mobile services have their Android apps. 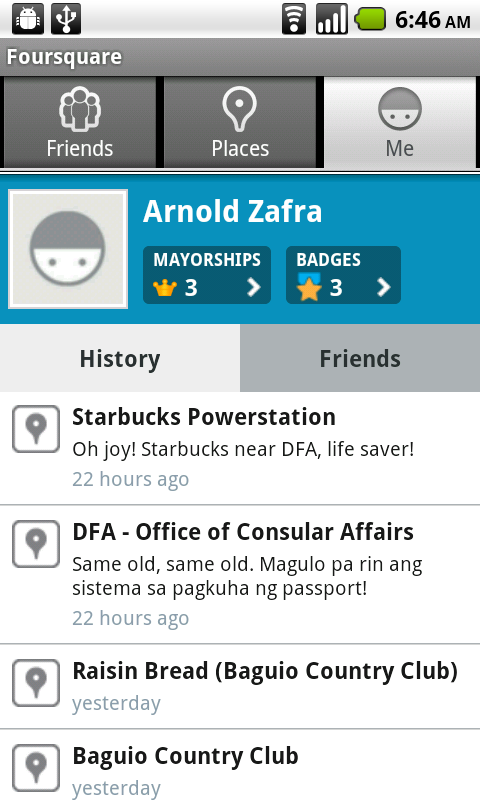 I’m more inclined to recommend Foursquare since I found it more robusts, sleeker and gets the job done pretty well. 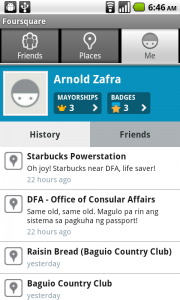 Here’s a quick review of Foursquare for Android features. Foursquare for Android lets you check-in as quickly as you devour that steak you’ve ordered. With just one click and you can return to your drinks and party on through the night. Foursquare also lets you use Android’s homescreen feature by allowing you to add a homescreen shortcut for the app so that you can easily maintain your Mayorship of the different places you’ve checked-in to. Next, something which I really appreciate about Foursquare app is the fact that it doesn’t drain your Android phone’s battery too much. If you’re using the Nexus One, you know how fast apps drain battery juice. Thankfully, Foursquare for Android won’t give you that problem as it has no “location aware” always on background service. Another great feature is integrated inline Google Maps that gives you views of nearby places so that you can easily hop from one bar to another or one restaurant to another. Finally, the app adapts the total Androd look and feel so much so that you won’t think that you actually running a third-party Android app. 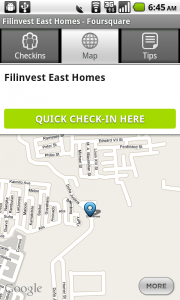 Overall, Foursquare for Android is great app that would satisfy Foursquare fans. If you’re not into location-aware social networking stuff such as Foursquare, now may be the right time to do so. And what a better way of trying this kind of service than on your Android phone.